The client, a private bank and wealth management trust with offices around the world, works with high net worth clients ranging from sovereign wealth funds to corporate brands. Given the sensitive nature of wealth and asset management, risk is of serious concern to the bank’s client base and is something the bank takes very seriously. To best serve its clients across multiple portfolios, the bank must dedicate itself to mitigating risk at every level of business, including aircraft leasing. Experience is another major concern for the client. As a financial institution, the client often has limited experience navigating within the private aviation market; therefore a lease return process can put the bank at potential risk. For these reasons, it was important that the bank work with knowledgeable industry experts who would be sensitive to their client’s relationships, as well as diligent in protecting their interests in a very expensive asset. When the lease of one of the bank’s private aircraft reached its termination date, the bank required the expertise of a qualified aviation consultancy firm to handle the lease return management process, as well as oversee the aircraft’s eventual sale. The bank initially contracted a different consulting firm to negotiate the lease return terms but, after a negative experience with that firm, the lessee requested that the bank switch firms. Based on the referral of an attorney from a trusted law firm, the bank contacted Essex Aviation and scheduled interviews with existing Essex clients. The bank was impressed by the firm’s references, especially those in the financial services industry, which helped demonstrate a clear understanding of the bank’s objectives. Based on the attorney referral, stellar references and additional due diligence, the bank retained the services of Essex Aviation. Essex worked closely with the bank, clearly explaining the need to focus on specific areas of the asset and walking them through every aspect of the aircraft return process. 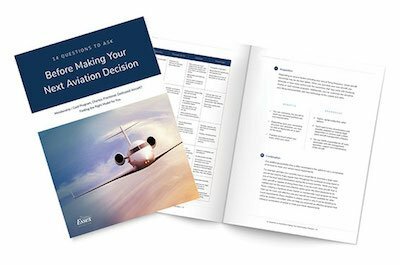 Lee Rohde and Thomas Mitchell of Essex Aviation were able to identify potential issues with return conditions early on in the process. The return conditions laid out during the initial lease negotiation where broad, which the lessee attempted to overlook and therefore avoid certain costly obligations for returning the aircraft to the bank. Rohde and Mitchell quickly got to work, representing the bank’s best interests while maintaining a positive, cordial relationship with the lessee. Once the aircraft was returned, Essex oversaw the inspection at the Dassault Falcon Jet service center in Little Rock, Arkansas and made storage arrangements. Essex then went on to represent the bank’s interest in partnership with their selected aircraft broker during the sale of the aircraft, ensuring a smooth transaction process every step of the way. Essex was able to provide the expert insight the bank needed to mitigate risk and costs and achieve the greatest return on investment during the subsequent sale of the aircraft, all while acting as a system of checks and balances for the bank’s selected aircraft broker. A representative for the bank said it intends to call upon Essex for any of its future aviation needs. Said one employee, a VP of credit risk assessment directly responsible for communicating the bank’s needs to Essex Aviation.